Eden Guesthouse - Kimberley Accommodation. 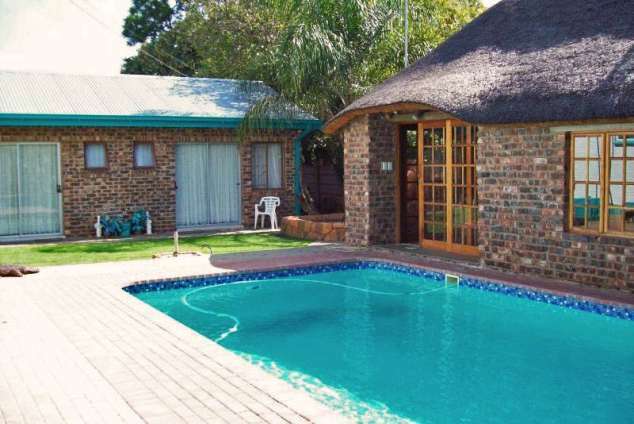 Eden Guesthouse is situated in the suburb of Hadison Park and offers 5 fully equipped luxury and comfortable double and single bedrooms sleeping 1 to 4 persons each with an en-suite bathroom and private entrance. We offer air-conditioning to make the hot summer nights a breeze and for the colder winter nights we offer the added comfort of an electrical blanket. The rooms are separate from the main house. Large swimming pool. Outdoor braai available. Reliable staff cleaning the rooms daily with clean linen, fresh towels, soap, shampoo and bodycream. We offer our guests peace of mind with secure off-road parking with remote controlled gate (Each room has got it's own remote to come and go as pleased). Daily laundry services are optional available. Pets (arrange beforehand with host) and children are more than welcome. The following are within 2 - 10 km from the Guesthouse. "The Big Hole", Airport, Car hire, Flamingo Casino, Absa Park Stadium, Shopping facilities (Diamond Pavilion Mall, Pick & Pay, etc), Virgin Active Gym, laundry facilities, medical facilities, cinema & restaurants. Eden Guest House offers an ideal and peacefull stay-over spot for the tired business man and tourist. We pride ourselves in the fact that we provide quality accommodation at affordable prices as well as warm Northern Cape hospitality at its best. Breakfast is served daily in the dining room or in the room if preferred . Dinners are available on Request. 39597 page views since 16 Nov, 2007. Last updated on 06 Dec, 2018.